The sign says "30" and the street says "FAST". Each of the three travel lanes on this street appear to be at least 11 feet in width, all going in the same direction. According to MGL Ch90 Sec17 the speed limit for a "thickly settled district" is 30 MPH. Yet, when looking at this wide open expanse of asphalt, is it any surprise that the speed limit is routinely flouted? A speed limit that is already set too high: The chance of a pedestrian being seriously injured or killed if struck by a car is 45% if the car is travelling at 30 mph but only 5% at 20 mph. Jeff Speck has recently written an article calling upon all cities and towns to replace their 12- and 11-foot travel lanes with lanes no larger than 10 feet. This article is timely. Boston continues to design streets with 11 foot travel lanes, like Beacon Street, and the new design for Commonwealth Ave. This decision to build wide, highway-like lanes is a terrible mistake, with disastrous consequences for anyone not surrounded by two tons of steel. 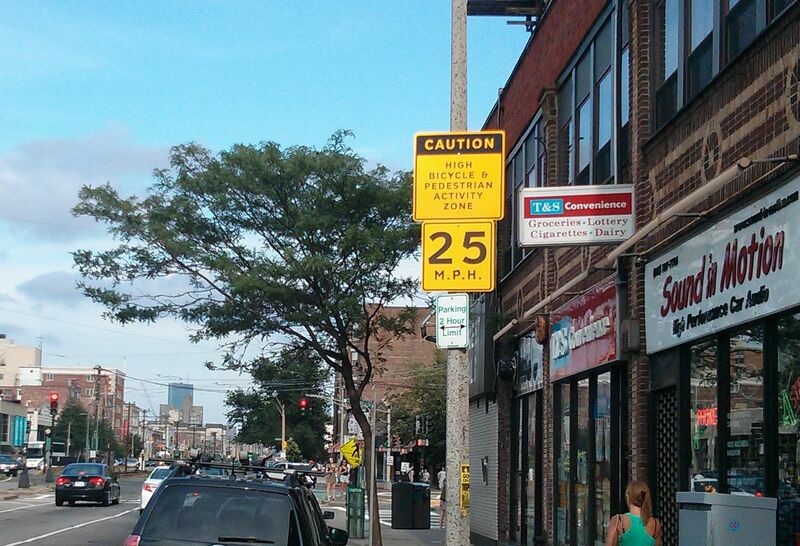 On Comm Ave, the city is actually planning on a 35 MPH design speed, even though the speed limit is 30 MPH, and the city itself recommends 25 MPH as a limit. Boston has an unfounded belief in tiny, barely noticeable signs. By designing and building such high-speed roadways, it's almost as if the city is encouraging drivers to break the speed limit. The situation would be ludicrous if it weren't so deadly serious. If Boston officials truly want safer streets, and I believe that they do, then it's time to reduce design speeds on all upcoming and future street plans. 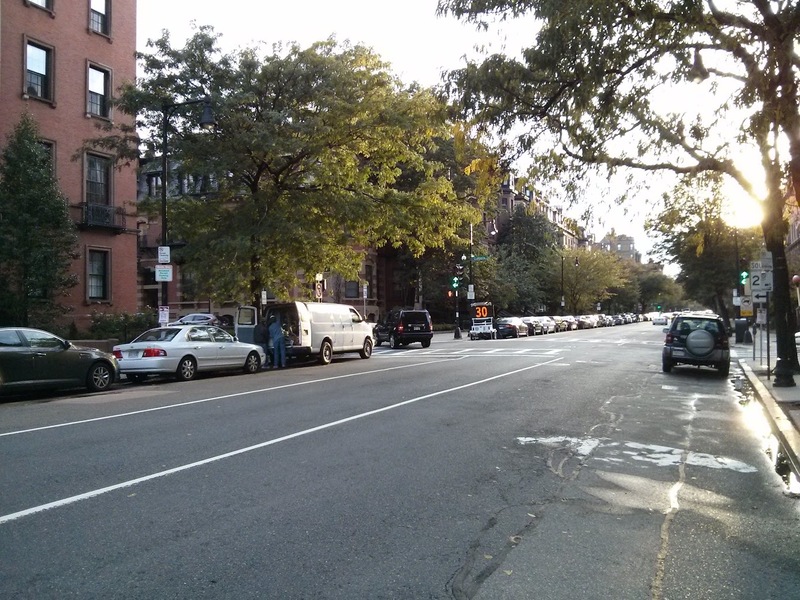 And for Beacon Street, it's long past time to re-stripe smaller and fewer lanes. That street may not be up for reconstruction for a while, but that's no excuse not to do some planter and paint-based interventions in the meantime. Sam Wallace, president of the Neighborhood Association of Back Bay, who lives in a condominium at the scene of Saturday’s crash, said speeding has become commonplace recently and pedestrian safety in the area is a major concern among the residents. A flashing sign does nothing. 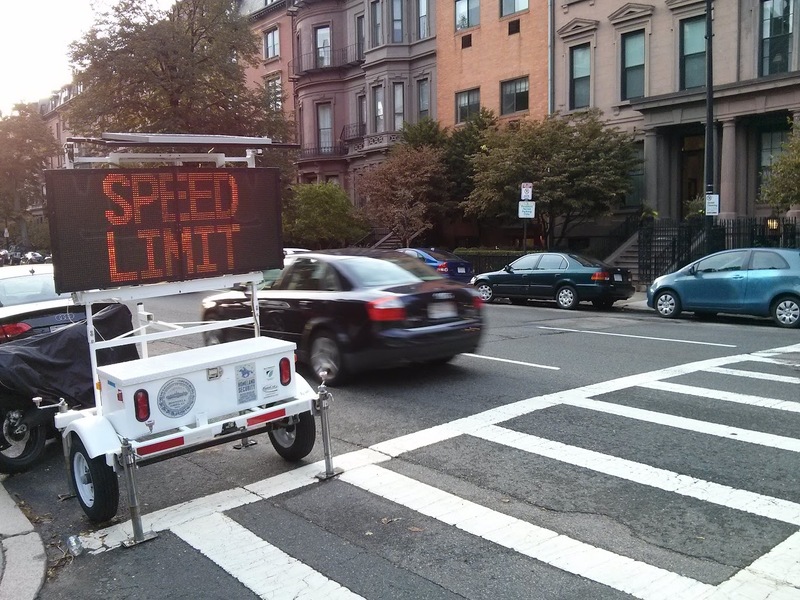 The city must face the fact that Beacon Street, and many like it, are overbuilt in favor of speed. That is the problem that must be resolved. One relatively easy thing the city could do is to time all the signals in the Back Bay (including Beacon St) for a 12-15 mph progression speed, and post signs informing people of this. People can't speed as easily when doing so means hitting lots of red lights. But more importantly, a slower progression will entice people to drive at that slower speed and will result in a green wave for bicyclists, who typically travel between 12-15 mph. More convenient for bikes. Safer for everyone. It's a win-win really. There are other issues with that street. As the name implies, it's called Beacon Street because it was laid out to have a clear view to Beacon Hill, so people could, well, see the beacon in case it was lit (indicating naval attack on Boston). And it's one way. And there is parking on both sides. So people are constantly tempted to hit the gas, only to encounter some ahead who is trying to park. It really needs to be made a two way street again.